1. What is a title search? 2. Why do I need a title search? A title must be deemed "good and marketable" before the settlement process can continue. The results of the title search identify (among other things): the current owner of the property; any liens on it; and any limits on how an owner can use the property. Our attorneys will examine the title search report to determine what - if anything - must be done in order to clear the title to the property so that the buyer can obtain their (and lender's) goal of a "good and marketable" title. 3. What do I need to bring to closing? All parties must bring valid government issued photo identification such as a driver's license or passport to the closing. Buyers must bring sufficient certified funds. This is usually done by a cashier's or certified check, and can also be done by wire transfer. 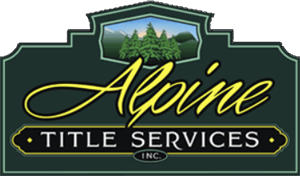 If the buyer has brought more than the amount required to the closing, Alpine Title Services will issue the buyer a check for the excess. If you are a seller and a non-resident alien (i.e., a Foreign Person as that term is used under the IRS regulations), please immediately alert Alpine Title Services to this. If you are subject to withholding and you fail to alert us, this could delay the closing. For sellers, nothing else is required unless you choose to have your proceeds wired into your bank account - in which case you will need to bring specific wiring instructions for the account to which the funds will be transmitted. This is most easily accomplished through a voided check or deposit slip on that account. Homeowners who are refinancing, taking cash out and wish to have the funds wired should similarly bring wiring instructions, a voided check or deposit slip to closing.